A few years ago, I asked my father, a former photographer, why he never taught me photography. He answered, "you're smart enough to figure it out yourself." He's right. I've always been good with figuring things out. My brain works nonstop—hence, the permanent stressed expression on my face and the furrowed brow that's turned into wrinkles. But that's a story for another day. While I was in training at work, I saw a girl wearing a long and sheer yellow maxi skirt. She looked so fabulous gliding through the building. I had to have that skirt. I thought of it. I dreamt of it. I must make it. So I did. *photo courtesy of my amazingly talented friend. 1. Take your fabric and fold in half. 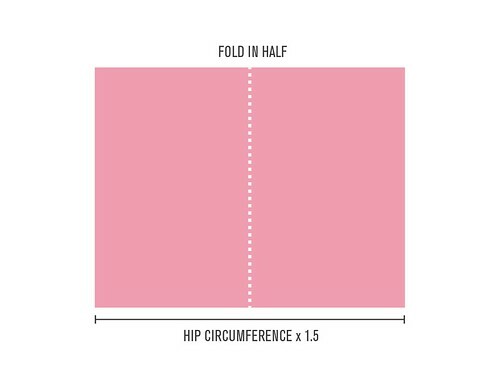 The width will vary depending on your size, but the minimum should be your hip circumference x 1.5. For example, my hips measure 34" around, so 34 x 1.5 = 51". I recommend making it bigger so you can walk comfortably. 2. 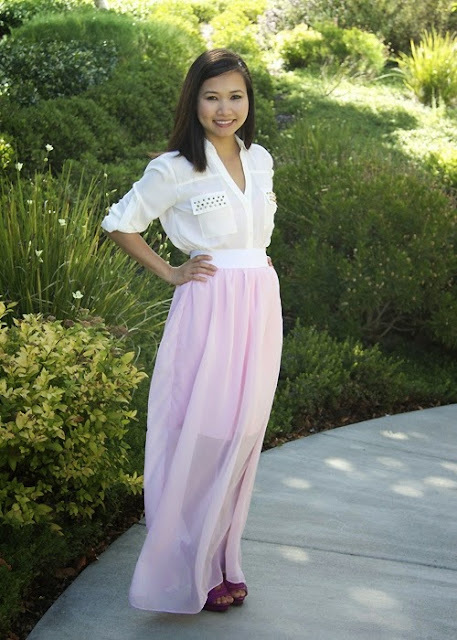 Cut your skirt like the image shown below. Make sure the top and bottom are slightly curved. If not, your sides will appear to be longer than the front and back when you put the skirt on. You should have two pieces. 3. 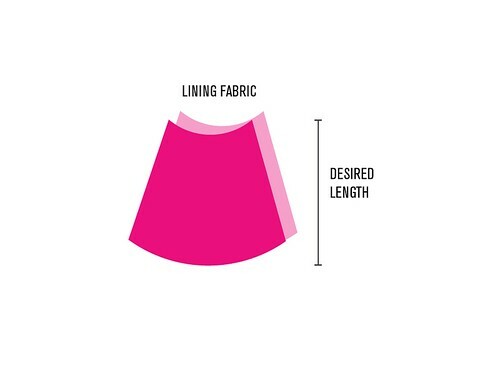 Cut your lining fabric in the same way, but shorter. The length of this depends on you. I made it reach my knee for modesty's sake because I didn't want to get in trouble for dressing "inappropriately" at work. 4. 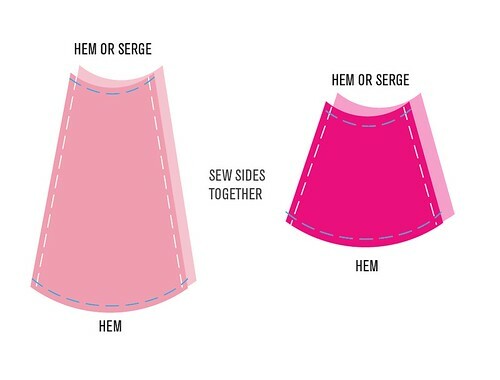 Hem/serge the top and hem the bottom of the 4 pieces. Sew the two sides together. I hem everything since I don't have a serger. Knit doesn't fray easily, but chiffon is notorious for falling apart. 5. Place the lining inside. I sew the lining and the chiffon fabric together at the top because it made it easier to gather later. 6. 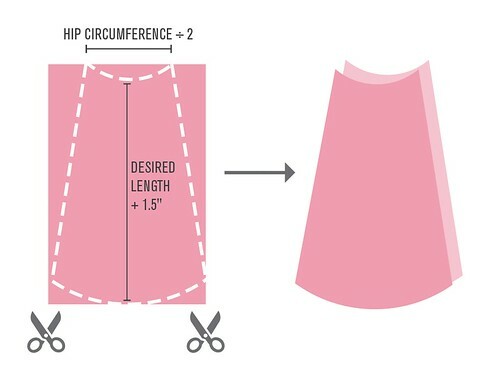 Cut your elastic to your waist size, then gather your skirt to the elastic. Do not make it larger than your waist. It should sit perfectly without discomfort around your waist. 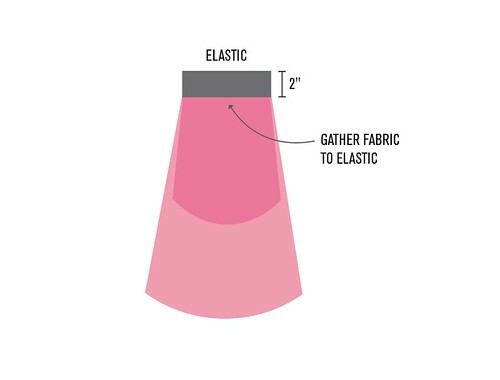 Make sure when you gather your fabric that you stretch the elastic to the size of your skirt and then sew. Here's a video tutorial on how to do it. bao, you look gorgeous!! good work on the skirt, i AM jealous! I basically have a pile of chiffon in my lap doing absolutely nothing because I'm stuck on instruction 6. On the video tutorial it says you have to have an open seam, but you've told us to hem everything, which means it's NOT open? So it completely contradicts everything you've taught us. How on earth does that work? This is incredibly frustrating, and there's no where to go from here as the instructions aren't clear enough to understand and move on. Please help, the only other option from here is to just throw the material away as it's all useless now. Hi Jazmin, I apologize for the instructions not being clear. Hem the top and bottom of the skirt so the fabric doesn't fray. The sides are sewn together, but not hemmed. The video has several ways on how to add elastic, "gathering" is the one I was referring to. It's at 4:23, I'm adding the link here https://youtu.be/y1ZD88zs6eU?t=4m23s (hope you can see it). I have found another video that shows exactly how I did my skirt. Hope I can explain it better here. You should have the lining and the chiffon sewn together at the top where the waist is. 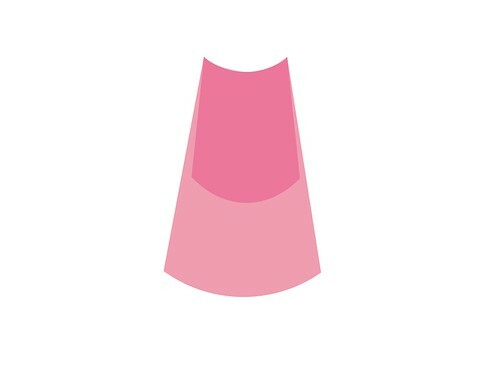 Measure your waist and minus about 2-3 inches from it (depends on how loose or tight you want your skirt to be). For example, if your waist is 26 inches, you take 2 inches from that to be 24 inches. Cut your elastic to that measurement (i.e. 24 inches). Now your elastic is actually shorter than the measurement of your skirt at the top opening. Stretch your elastic to be the same size as your top skirt opening and use pins to the elastic and the skirt together. When you sew the two together, you will stretch the elastic as you go so when you're done, the elastic will "gather" the fabric to fit its size. I'm just wondering...how do you pleat it. Only because yours looks like it has darts in.